I have always wanted to try an apple brownie or bar recipe. 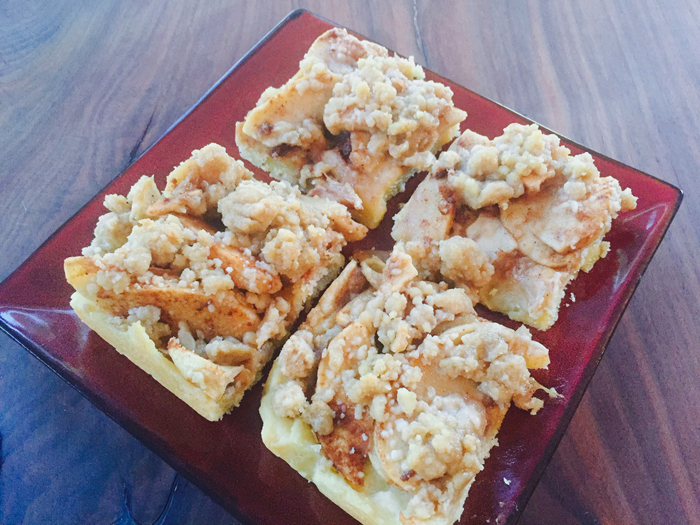 I came across this recipe for Apple Pie Bars a couple weeks ago and decided to give it a whirl with some of the Fuji apples from the kids' most recent run down our lane to the apple trees! Our Fuji crop is just so delicious this year, we can't seem to munch enough of them right now. Theo helped me make this delicious apple treat last night. He got a kick out of the three step process and it seemed to hold his attention quite well. His favorite step was speading the dough into the parchment-lined baking pan. Well, it certainly didn't taste like sand. We all enjoyed a generous piece of our Apple Pie Bars after dinner. I am looking forward to trying this recipe again with our Granny Smith apples next week! Preheat the oven to 350 degrees. Line a 9 x 13 pan with parchment paper. To prepare crust, mix egg, butter and sugar until creamy. Add in flour and salt gradually. Once combined, transfer mixture to pan and spread gently and evenly. Bake crust for 15 minutes. 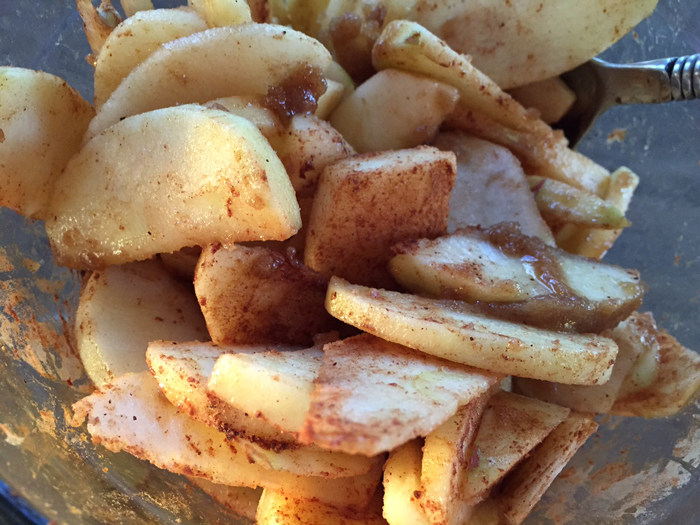 To prepare filling, combine apple slices, butter, brown sugar,cinnamon and nutmeg in large bowl until ingredients are well incorporated. Top baked crust with filling. To make topping, combine remaining ingredients in a small bowl using a fork. Once topping is crumbly, spread it on the filling. Bake for 35 minutes. Cool and serve immediately.